If you are familiar with downtown Las Vegas and Fremont Street, you undoubtedly know the El Portal building. Blink and you might miss it, but this small building is one of the oldest remaining structures in downtown Vegas. The hacienda-style building was built in 1927, and opened its doors as a theater in June of 1928. Throughout the years, the building has experienced a handful of remodels and changing uses, but has always remained recognizable as the old El Portal theater. That’s all about to change. On Tuesday evening June 13th, the Las Vegas Planning Commission will vote on a proposed special use permit (SUP) which, if approved, will allow the redevelopment of the El Portal into a new food mall/tavern establishment. The application proposes a new façade design for the El Portal building. The proposed design calls for the complete destruction of the existing façade. As seen in the renderings accompanying the SUP application, the existing hacienda-style façade will be replaced by an open-air structure, and an abstract LED railing as the focal point for the building. This design all but erases the landmark features we have come to know and love at the El Portal, and it will virtually eliminate all sense of history that the building represents. The full SUP application materials can be viewed here, items #72, #73, and #74. We at Nevada Preservation are not going to stand by quietly on this. While we understand that building uses change over time, we also know that the practice of adaptive reuse leads to buildings that are more economically viable, creating a sense of heritage and history for locals and tourists alike. We do not necessarily oppose the proposed use change, but we are asking that planning commission hold off on the approval until a more historically sensitive and compatible design is achieved. And we are asking YOU to HELP US deliver this message! Join us in opposing this SUP application at Planning Commission this Tuesday, June 13th at Las Vegas City Hall on Main Street. We will be arriving about 7:00pm, and will be seated in the back right area of the auditorium. If you are not able to join us at Planning Commission, you can also submit your comments online here. Be sure to reference case #SDR-69675. While modest in its footprint, the existing El Portal is one of the few remaining buildings of early, 20th-century Fremont Street. The existing hacienda-style façade and interior beams are all that remain of the original structure. However, it is not hard to imagine what it looked like in its earlier days. It was designed by architect Charles Alexander MacNelledge for William Pike and Ernie Cragin, who later became the Mayor of Las Vegas. 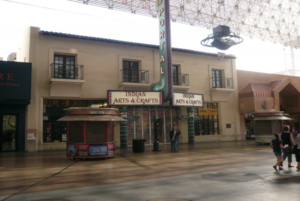 The El Portal was an immediate success, and remained the cultural hub of Fremont Street well into the 1960s. It was the first building in Las Vegas to be air-conditioned; advertising for “manufactured weather” can be seen hanging from the original marquee in old photographs. 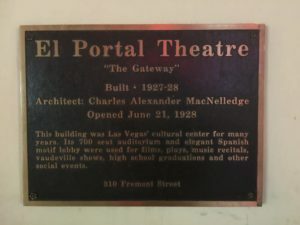 As cited by UNLV Special Collections, the “El Portal reigned through the coming of talkies in 1929, the Depression years of the ’30s, the World War II years of the ’40s and into the ’50s. Frank Sinatra introduced the movie “The Joker is Wild” at its Hollywood-style premiere, held at the El Portal Theater in 1957.” The building has since been home to a gifts and souvenir shop, the El Portal Luggage Shop, and today houses the El Portal Indian Arts and Crafts shop. Although the building has changed over time, and some of its historic integrity has been compromised, it has nonetheless managed to retain its early history and character for the majority of this last century. We refuse to let this 90-year-old building go down without a fight! Please join us in advocating for the preservation of this important building, and let Planning Commission know that you oppose the proposed design accompanying this SUP application! I fully support the preservation of El Portal, and keeping the heritage of what it represents. For our future generations, cultural significance, and history of the early 20th century. Nevada is a shining city with a rich history…let us showcase our beginnings, let us rejoice in our heritage!!! Let us teach children to respect our past, if not what lessons, or example shall we provide?? PLEASE. This is not a matter we will take lightly, nor is it a neon light that we simply discard. It most certainly is of great importance to all of us!!!! El Portal movie theater building was changed in any way. The building is part of Las Vegas history. Do not allow the proposed change to take place. As a docent at the neon museum, I talk about the El Portal movie theater and it’s importance. Please make sure to submit your comments to Planning Commission using the link above. Thanks for the support! I have submitted my comments to the planning commission for consideration. I am going to try to make the meeting too, but it is tentative at this point. Thank you for supporting this historical preservation. It is sad how our history keeps being destroyed for the sake of big business and people who do not care.